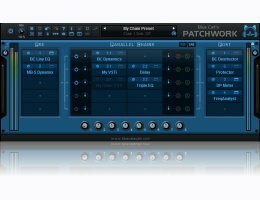 Blue Cat Audio PatchWork is a universal plug-ins patch bay that can host up to 64 VST plug-ins into any Digital Audio Workstation (DAW) in one instance. It is possible to chain effects in series or create up to 8 parallel chains that can be activated independently. This lets you create your favorite effects or instruments configurations within the plug-in, without the need for multiple buses. These configurations can be saved as presets and recalled instantly, or shared with multiple DAWs, using any plug-in format. If you are looking for a multi-band VST host for multi-band processing, check out the Blue Cat Audio MB-7 Mixer plug-in. Also, any Blue Cat Audio plug-in is compatible and can be hosted by this plug-in. Mac OS X Mavericks(10.9), Mountain Lion (10.8), Lion (10.7), Snow Leopard (10.6), or Leopard (10.5). Download a demo version of Blue Cat Audio's PatchWork here.